Hello Everyone!!! Hope you've all had a great week so far! I know I have had quite a busy one trying to get this flyer out and yes! Done! So what is FEC 7 about?! It's about the parts many creative entrepreneurs (including myself) run away from... the Accounting . Legal . 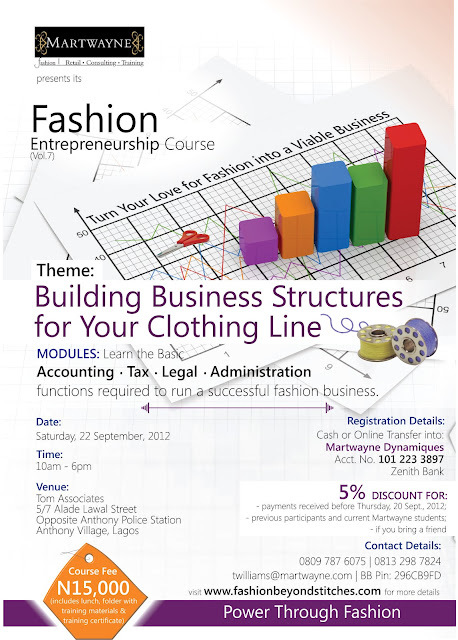 Tax & Administration functions required to run successful fashion businesses. But as much as we would love to run away from it, we cannot avoid it. So it is vital we learn how to basically "put it all together" in order to run a successful and viable fashion business. And this is where I bring all my KPMG experience into play. It is amazing what you learn in such an environment. I operated in so many areas from company secretarial duties to advisory opinions, to obviously tax compliance services... - even payroll services. Amazing what being in the Tax, Regulatory & People Services Unit of such a big firm can do to you. So yes it will be a long but FUN day, 10am - 6pm, but well worth your while... Don't worry we are organizing some serious lunch! And from what I've heard about Tom Associates's lunch packages, it is like a serious PAR-TY!!! So please register early and claim your discounts so I can book your lunch. And here's the information I plan to send out about the Course. As always, there are discounts available for eligible participants. Volume 7 of Martwayne’s Fashion Entrepreneurship Course is the last Volume of the Fashion Entrepreneurship Course series. We have come a long way, learning the creative, production and business aspects of starting a clothing line and this month we will be discussing the corporate structures necessary for building strong fashion businesses and in fact any business organization.... basically putting it all together. And FEC 7 promises to be a packed one! +234 809 787 6075; +234 813 298 7824 / twilliams@martwayne.com / BB Pin: 296CB9FD or visit www.fashionbeyondstitches.com for more details. We look forward to welcoming you on the 22nd.